The Roman Catholic Archdiocese of Beijing is undertaking a substantial restoration and renovation of its most famous church, the Xishiku North Cathedral, in a way that would have contented Ruskin’s sensibilities. China’s authorities have decided that the church is so important to the cultural and historical legacy of Beijing that they have provided more than twenty-five million RMB (approximately four million USD) to restore and update the façade and interior. The church boasts the largest Catholic congregation in Beijing. Scholars of Church history in China have been consulted in order to restore elements of the interior to colors and aesthetic as it first appeared in 1887. Several elements of the renovation are intended to “update the architectural theology of the church to better respond to the life of the Church in the twenty-first century,” noted Father Matthew Zhen Xuebin when we met in mid-January. The pastor of the church and director of the restoration project, which includes the historic bishop’s residence, he studied liturgical history at Saint John’s University in Minnesota, and was assigned by the ordinary of Beijing, Bishop Joseph Li Shan, to oversee the project. Beijing’s major Roman Catholic churches are more-or-less located in the four cardinal directions. North Church is named after the Holy Savior; South Church (the present cathedral) after the Immaculate Conception; West Church after Our Lady of Mount Carmel; and East Church after Saint Joseph. Only Beitang survived the Boxer Rebellion during the summer of 1900. All the other Christian churches in the capital were razed, and only some were rebuilt. Local faithful commemorate Beitang’s towering Gothic façade as a testament to Christian survival and endurance during times of political and religious conflict. The first Beitang was erected slightly to the south of the present church, in an area called Canchikou. It was completed in 1701 on property only a short walk from the Forbidden City, given to two French Jesuit missionaries by the formidable and pro-Western emperor, Kangxi (1654-1722). Charles de Belleville, SJ, (1657-1730) designed this first church in the manner of the Baroque mother church of the Society of Jesus in Rome, the Gesù, which was consecrated in 1584.2 Unlike the Gesù, it had no volutes or raised section in the center of the façade. De Belleville, like many of the Jesuit builders in China during the seventeenth and eighteenth centuries, was both an architect and painter. The interior included sixteen engaged columns with Corinthian capitals, arched windows, and stunning paintings of the saints composed in the Western style. In 1827, the first Beitang was demolished after being seized by a court official to add to his private estate. It was not rebuilt until 1867, when the French ecclesial architect Bernard Gustave Bourrières (1807-1867) was commissioned to rebuild it in a grander style. Bourrières’ design was decidedly Gothic, as the bishop requested. Its façade featured two flanking towers, each with two layers of lancet windows and three dramatic pinnacles that lengthened the visual height of the church. The central gable above the main entrance was surmounted by a cross, and included three niches. A statue of Our Lady of Lourdes occupied the center niche. 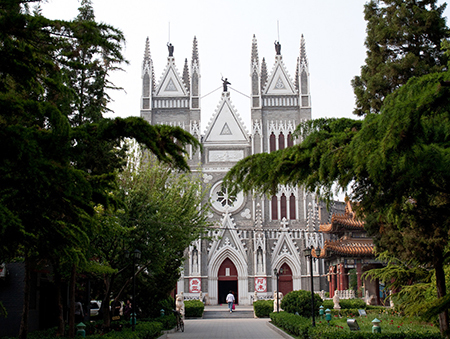 Eight years after the imposing Gothic façade was consecrated, the Empress Dowager Cixi (1835-1908) informed the missionaries that she had decided to expand her retirement villa into the area where the cathedral then stood. After several rounds of negotiations, the next location of a new and even more majestic Beitang cathedral was settled a short distance north. Favier intentionally exaggerated the Gothic elements of the previous Beitang. The portals and windows of the new church were more noticeably Gothic, adding generous ornament to accentuate its French appearance. The new façade included two towers flanking a tall gable ornamented with crockets, a large number of finial-capped pinnacles, arcades of finial-topped trifoil windows, a heavy-framed, spoked rose window, undecorated archivolts above each of the façade’s three portals, several niches, and gargoyle drain spouts. 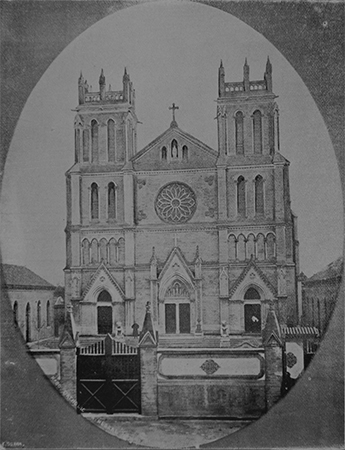 Favier’s Gothic edifice was a stark contrast to the sloped roofs, bracketed beam construction, and Chinese-style latticed window structures that surrounded the towering cathedral. Among the most controversial features of Western church design in China was the construction of tall towers. Catholic architects considered them necessary elements of a truly Christian edifice, but most native Chinese saw them as domineering symbols of Western conceit. 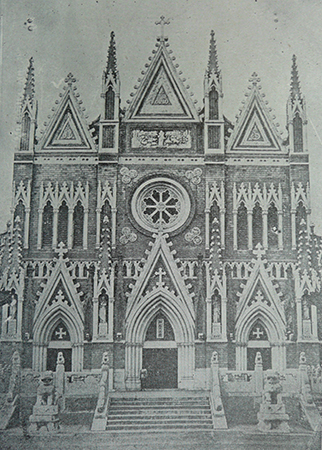 When Alphonse Favier first designed his Beitang cathedral in 1886, China’s imperial authorities limited the height of the two Gothic zhonglou flanking the façade. 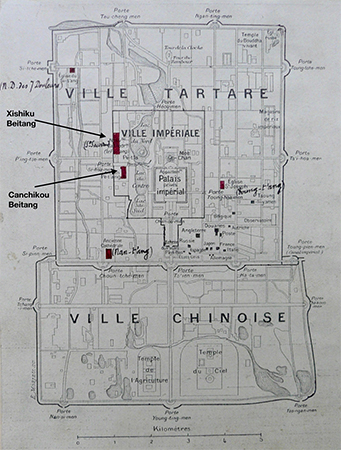 Even though the court authorities had signed an agreement on the height of Favier’s plans, once the church was finished the reality of their overshadowing presence was seen, and these same officials came from the palace to “register their protest for their height.”3 China’s sumptuary laws in 1886 proscribed architectural structures that contested the divine supremacy of the emperor, and Beitang’s new towers seemed to overshadow that prerogative. In the end, the towers remained as they were, and after the Boxer Uprising (1898-1900) had ended, Bishop Favier was able to attain permission to extend the towers to an even taller height. The Beitang façade seen today is the one completed in 1901, when the towers were extended to produce a more proportionally attractive façade, adorned with Gothic flourishes that are still admired. Despite the cathedral’s recognizable Gothic appearance, when one more painstakingly observes Favier’s majestic façade, she or he discovers that the finials, crockets, and gargoyles more closely conform to Chinese temple design than French Gothic. In fact, I would describe the cathedral’s final design as Sino-Gothic, an admixture of Gothic Revival elements and Chinese details, such as dragon-like gargoyle drains and Chinese white marble accents. This is all to say that when Western architectural scholars describe Beitang’s aesthetic components they do so in Western terms; they view the church simply as an example of Gothic Revival design. Chinese scholars see in the church design a dominant Chineseness, more representative of late-imperial temple design than Western church styles. In the end, Beitang’s architectural legacy embodies Sino-Western cultural exchange rather than a merely Western edifice on Chinese soil. It is precisely this aspect of the church’s design that appeals to Chinese Christian sentiments, and has motivated Beijing’s Catholic archdiocese and the state authorities to restore the church and preserve it for future generations of Chinese Catholic faithful. During my recent visit to the site of the cathedral and bishop’s residence, I was provided with a private tour of the entire complex by the rector Father Zhen and Father Simon Zhu Jie, vicar for external church affairs. When the church and bishop’s residence are both finished, Bishop Joseph Li Shan will move into what was originally built for the church’s architect, Bishop Alphonse Favier. Father Zhen’s vision for the restoration both restores much of the cathedral’s original splendor, while simultaneously updating some of the church’s elements to better facilitate current needs. Every element has taken into serious consideration the values of proportion, use, and sympathy with its original architectural legacy. After considerable research, the interior has been renovated to represent the original color scheme Favier envisioned when he drew the original plans in 1886. Much of the church’s interior was changed when it was used as a cafeteria. The columns, for example, made from pine trees imported from the American Northwest, were painted dark red and green in 1985, while the original colors were much more light, probably light gold and blue. 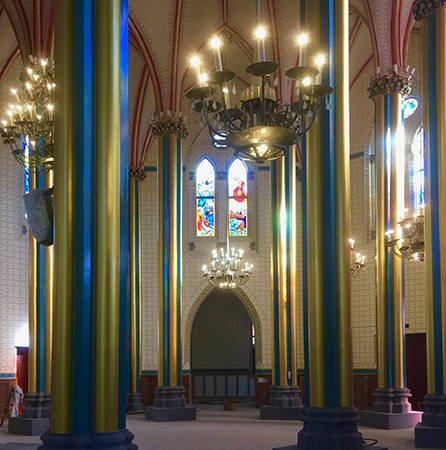 As one enters the restored interior today, one is welcomed by the original vibrant colors and light that have not been present since the cathedral was first opened for worship in 1887. Age-related problems had become so severe that repair and restoration had become a pressing matter by the early twenty-first century. The foundation had settled in areas, persistent leaks plagued several areas of the roof, and outdated electrical wiring had all raised safety concerns as the church has continued to experience more, rather than less, Mass attendance in recent decades. As early as 2012, the Beijing Cultural Relics Bureau had already begun lobbying for major repairs and the restoration of the church, and in 2014 approval was granted to undertake the massive project. As the work slowly revealed infrastructural elements, more problems than expected required attention. A number of rafters and purlins had rotted due to moisture. Father Zhen noted that as much as two-thirds of some of the rafters and purlins had decayed, and he told me how thankful he is that no-one was ever injured from a structural collapse. As more and more structural problems were discovered, the costs accordingly increased, but were covered by state agencies. 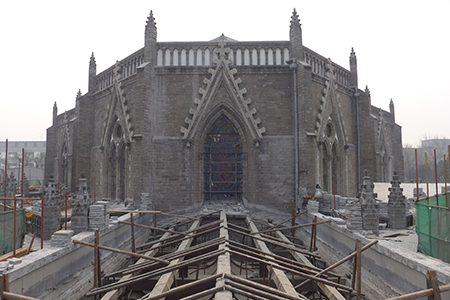 As it stands, all of the church’s structural problems have been resolved, and mostly cosmetic work and final touches remain before the church is restored to its status as the cathedral of the Archdiocese of Beijing. The discovery of painted murals badly in need of restoration proved so costly—estimated at more than twenty million RMB—they were carefully protected to await future attention. Among Father Zhen’s innovations, which are all in good sympathy with the church’s original Gothic aesthetic, is an entirely new scheme of stained glass windows. Favier’s original windows did not contain images, so this is the first time the church windows display what Father Zhen calls “a catechism in glass.” The newly installed windows, designed and created in collaboration with experts in Hong Kong, trace the history of the birth of the Church, its growth in the West, its movement into China, and finally the history of China’s Catholic Church to the modern era. If one is facing the altar, the new stained glass windows to the left illustrate the origin of Christianity, the crucifixion of Saint Peter, and the history of the Western Church. Also represented is the Church’s entrance into China, where there is a representation of the Yellow and Yangtze Rivers, which represent China’s northern and southern regions. On the right side facing the altar, the windows focus on the growth of Christianity in China, featuring a splendid image of the Nestorian monument, which was erected in 781 during the Tang dynasty, and acknowledges the fact that the first Christian missionaries were not in fact Catholic, but rather members of the Orthodox Church of the East.4 Other images in the stained-glass windows feature the mission of the first bishop of Beijing, Giovanni da Montecorvino, OFM, (1247-1328) the Jesuit and Lazarist missions in China, and representations of significant persons in the history of Christianity in China, such as Vincent Lebbe, CM, (1877-1940) and the architect of the cathedral, Alphonse Favier. One window displays an image of the martyr saints of China who were canonized by Pope Saint John Paul II in 2000. Another window includes Korean Catholics who have a historical connection to the cathedral. The side chapels, which are no longer in use, have been refashioned for new uses, such as a cry room and a shrine dedicated to Our Lady of China, though at least one of the original side altars will remain in place because of its historical value. The church appointments that were hastily produced in 1985, when Beitang was returned to the Church, have been removed so that furnishings of higher quality can now be installed. The exterior façade of the cathedral features several niches with makeshift statues that were installed in 1985. These statues will be replaced with more refined and proportionally correct versions as soon as possible. The restoration of Favier’s lavish bishop’s residence—really an enclosed mansion with three dramatic courtyards directly to the west of the cathedral—is also a mixture of Chinese architectural sentiments and Western aesthetic preferences. The courtyards respond to the configuration of traditional Beijing siheyuan (enclosed four-sided court) residences, while the structures themselves resonate more with French ecclesial design. After the residence was opened as the Beijing Number 39 Middle School in 1958, many of the buildings were changed to accommodate their new use as a school. The buildings and the former bishop’s chapel are being restored as closely as possible to their original appearance based on historical photographs. Perhaps the largest difference between the restored bishop’s residence and what it looked like when occupied by the portly French bishop, Alphonse Favier, is that until the 1940s the various rooms of the mansion were teeming with rare Chinese art, crafts, and furniture Favier collected during his life in China from 1870 until his death in 1905. Within the sprawling bishop’s residence, the archdiocese has planned to establish a museum dedicated to Beitang and the history of the Catholic Church in northern China. Exhibited in this small museum will be such items as cultural artifacts related to the cathedral and Catholic culture in Beijing, as well as historical photographs that highlight the rich past of Catholicism in the city. The courtyards and structures of the residence will also feature elegant statues of Our Lady, Jesus, and important saints. As we passed through one of the long corridors leading to the old bishop’s chapel, we passed by what Father Zhen believes to be the white marble base of one of the columns of the Canchikou Beitang; discoveries such as this are being carefully preserved in order to conserve the architectural history of the Beitang complex. The final result of the extensive restorations and renovations of the cathedral and bishop’s residence will return the Beitang cathedral and bishop’s residence, located in China’s bustling capital city, to its former dignity as the country’s center of Catholic culture. Dr. Anthony E. Clark is the Edward B. Lindaman Endowed Chair and Associate Professor of Chinese History at Whitworth University. His most recent book is Heaven in Conflict: Franciscans and the Boxer Uprising in Shanxi (2017), and he is currently preparing a book on the history of Beitang and Alphonse Favier. 1. For an account of the transfer of the Beitang church, see W. Devine, The Four Churches of Peking (The Tientsin Press/Burns, Oats & Washburne, 1930). 2. For a description of the Canchikou church by a contemporary Jesuit, see Lettres Édifiantes et Curieuses, Écrites des Missions Étrangères, Vol. 17 (Toulouse, 1810). 3. Devine, The Four Churches of Peking. 4. See P. Yoshio Saeki, The Nestorian Monument in China (Society for Promoting Christian Knowledge, 1916).